Why doesn't gravity work when applied to Relative Layout? I already understand that if I use layout_gravity="center_horizontal" on the text view, then the text will be center. But I don't want to use that because I want to have as little code as possible and the best way to do that is by applying gravity="center_horizontal" to my relative layout. I am also asking this question because I am concerned about even using gravity or layout_gravity with relative layouts at all. As when doing my research I came upon this answer. Don't use gravity/layout_gravity with a RelativeLayout. Use them for Views in LinearLayouts and FrameLayouts. Even though it seems pretty apparent to me from the relative layout Android Documentation, which clearly lists gravity as a valid attribute, that Google intended these attributes to be used with relative layouts. If that quote is correct, how do I center views in relative layouts? 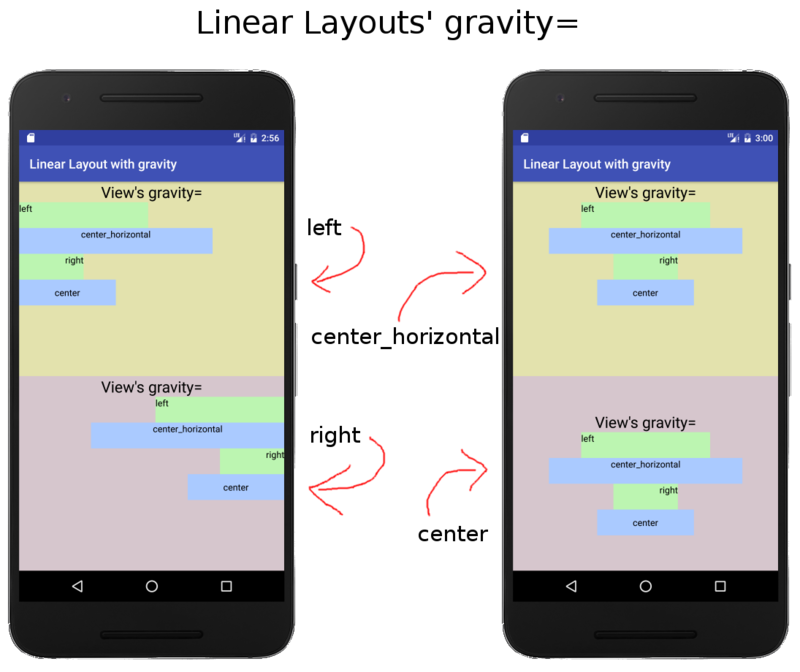 This is a supplemental answer to Gravity and layout_gravity on Android. My original statement that gravity and layout_gravity should not be used in the subviews of a RelativeLayout was partly wrong. The gravity actually works fine. However, layout_gravity has no effect. This can be seen in the example below. The light green and light blue are TextViews. The other two background colors are RelativeLayouts. As you can see, gravity works, but layout_gravity doesn't work. My original answer about gravity and layout_gravity dealt with these attributes being applied to the Views within a ViewGroup (specifically a LinearLayout), not to the ViewGroup itself. However, it is possible to set gravity and layout_gravity on a RelativeLayout. The layout_gravity would affect how the RelativeLayout is positioned within its own parent, so I will not deal with that here. How gravity affects the subviews, though, is shown in the image below. I resized the widths of all the subviews so that what is happening is more clear. Note that the way RelativeLayout handles gravity is to take all the subviews as a group and move them around the layout. This means that whichever view is widest will determine how everything else is positioned. So gravity in a Relative layout is probably only useful if all the subviews have the same width. When you add gravity to a LinearLayout, it does arrange the subviews as one would expect. For example, one could "save code" by setting the gravity of LinearLayout to center_horizontally. That way there is no need individually set the layout_gravity of each subview. See the various options in the image below. If one wants to set all the views at once, a LinearLayout would likely be better (or perhaps using a Style). The layout_gravity does not work for subviews in a RelativeLayout. The gravity of a RelativeLayout does work, but not as one might expect. Testing your layout, for me it's working (the TextView is centered correctly). 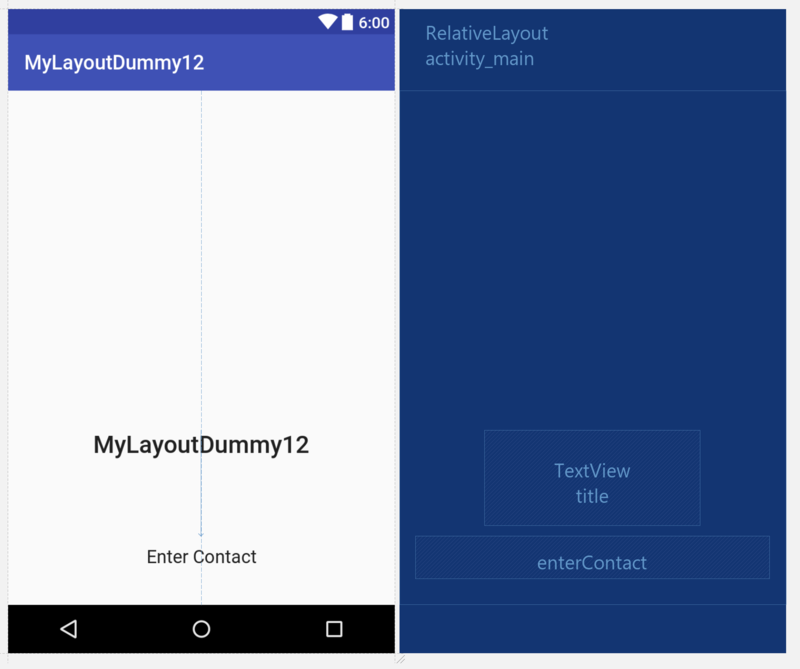 However, you could also remove android:gravity="center_horizontal" from the RelativeLayout and add android:layout_centerHorizontal="true" in the TextView. I've always had problems with RelativeLayouts and TextViews too. I think that this is due to the fact that TextView calculates its size dynamically and this prevents it to work well with layout's gravity. That's just one my supposition. The solution I generally adopt is to configure a textview horizontal size with match_parent. It might be a suboptimal solution, but should work. In case you need a Fixed size textView you can put a fixed size dimension and should work too, it gives problems only with wrap_content. with wrap_content should work too. The reason is in my head still the same: size of textView is calculated later. Specifies how an object should position its content, on both the X and Y axes, within its own bounds. 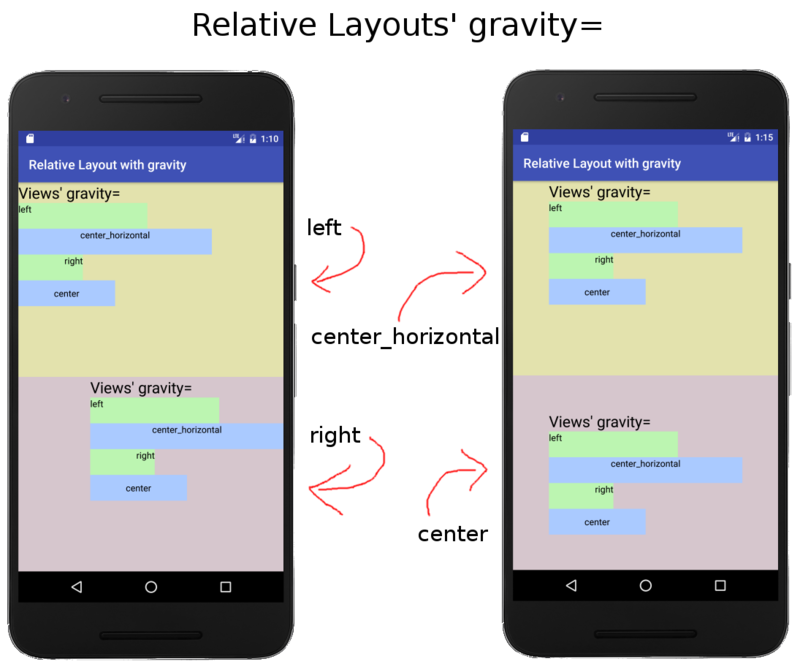 So the android:gravity="center_horizontal" will center horizontal-ing the RelativeLayout to its parent. Not making its content center horizontal. 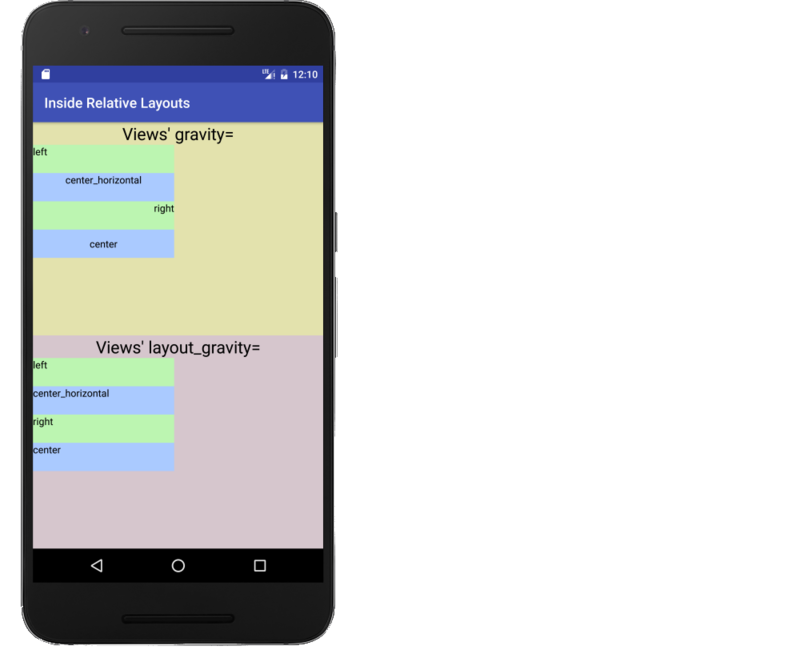 Remember that android:layout_gravity is used for the view itself relative to the parent or layout. Please be aware that the behaviour of Layout can differ slightly for each API Level. And be noted, that we can't 100% sure that the visual result in Layout Editor is correct. Always test your layout in real devices. Why does this work, while android:gravity (apparently) doesn't? 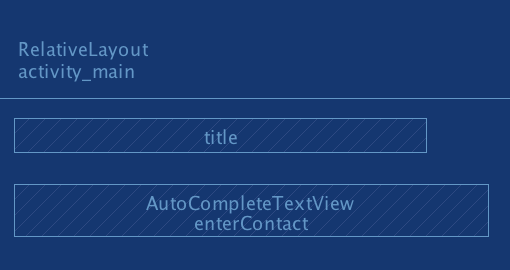 if your goal is to put the TextView in the horizontal center of the Layout/Screen you have to let the RelativeLayout know! 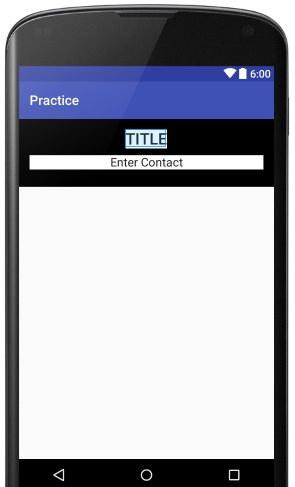 android:gravity is used by any View (like a TextView for example) to place its content inside. TextView is CENTERED in the RelativeLayout but text is at the TOP of the "box"
Not the answer you're looking for? Browse other questions tagged android xml android-layout relativelayout or ask your own question.